Salad with Tuna, Creamy Dressing, Thyme for Cooking salads. This is a light, heart-healthy summer salad, with walnuts, greens, and a tangy dressing made with Greek Yogurt, reminiscent of 'Ranch', but lower in calories and all natural. Prepare greens and put into a large salad bowl. Thinly slice celery, add to greens. 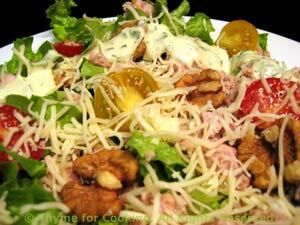 Arrange tuna, tomatoes and walnuts on salad. Sprinkle with cheese and drizzle a bit more dressing. Snip oregano and chives with scissors. Add oil, a bit at a time and whisk well. Add herbs. Note: This will keep a week... And makes a great dip for raw veggies.